Ken Ham, honesty, and AiG’s Reformation- A lesson in careful reading and hermeneutics | J.W. Wartick -"Always Have a Reason"
I recently responded (Ken Ham on “Compromise” and Stand to Reason) to a blog post–really a rant–by Ken Ham, young earth creationist. Well, Ken Ham apparently took issue with my own posts (and others’–see links at the end), and has offered another response. All block quotes are from Ken Ham’s post “To Help Bring Reformation” and all credit goes to him for the writing of said quotes. For a shorter response to Ham’s latest post, check out Unrecognized Agreement and Unity. First, it is worth noting that Ham doesn’t cite any specific sources for the views he attacks, so it may be difficult to draw out all the points. To be fair, it seems that at least a few of his points respond directly to my own blog post. I will try my best to draw out Ham’s points while offering another critique. Right! Well then it is part of the mission of the group to endorse, legitimize, and put forward as the truth the hermeneutic of reading a “literal Genesis”–by which it is meant a Young Earth view. But of course others read a “literal Genesis” and have no problems with old earth positions and indeed see absolutely nothing in the account as contradicting an old earth position. So, it seems that if YEC is supposedly a consequences of the position AiG holds, then YEC is absolutely part of the “reformation of the church” that AiG is trying to bring about. It is a consequence of their hermeneutic. But then there is the question of whether or not their are readings of Genesis which allow for or even call for an old earth position. Other inerrantists like C. John Collins or G.K. Beale argue that the passages do not necessitate a young earth position. Thus, it seems like, without argument, we once more have a YEC dismissing other positions as against “believing God at His Word.” This is the kind of subtle ad hominem attack that people who can sense logical fallacies will react against. Notice the dichotomy that is set up: if you “believe God at His Word” you will hold the same position as AiG; but if you don’t hold the young earth position, you therefore do not believe God at His Word. One can’t make a worse accusation against other evangelicals than this. But hey, why stick with subtlety? Yes, that’s right. 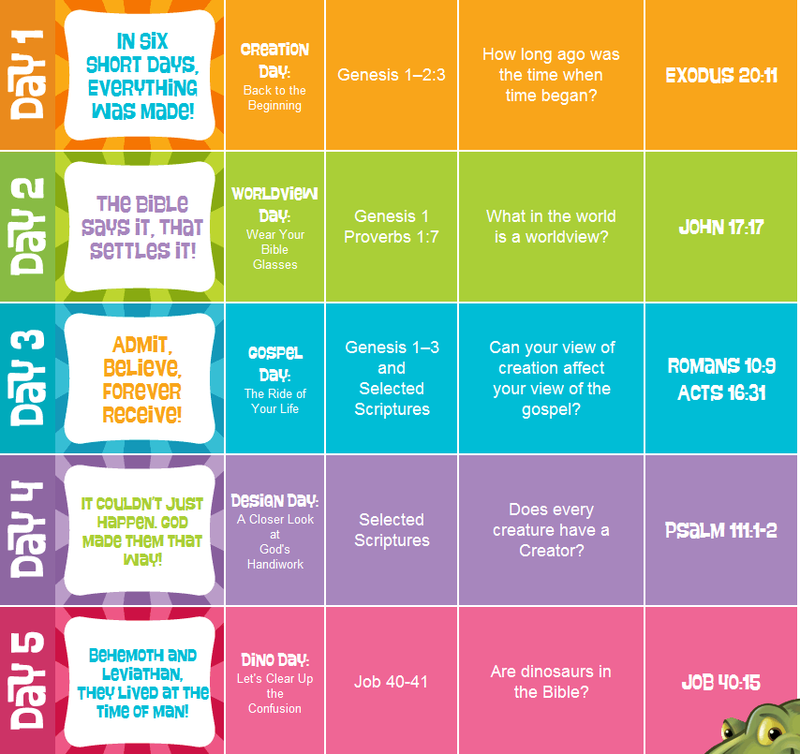 Apparently I (and others) falsely accuse a group named “Answers in Genesis” which actively promotes young earth creationism through books (including children’s books), a magazine, a research journal, and even a VBS program [image on right all credit to answersvbs] (notice that the entire curriculum is focused on Young Earth Creationism: day 1 is in six short days, everything was made; day 2 is the bible says it, that settles it [and note that in Ham’s other post he argued we should teach our children how to think, not what to think–or at least in addition to ‘what to think’]; day 3’s main question is “Can your view of creation affect your view of the gospel?”; day 4 is on intelligent design [admittedly this doesn’t specifically mean young earth]; day 5 is going to teach children there are dinosaurs in the Bible) of focusing on a young earth. Seriously, you did read that right. I and others are accused of falsely stating that Answers in Genesis is focused on young earth creationism. Look, I’m not saying it’s a bad thing to have your ministry focused on a specific area. In fact, I think that Christians who are strong in science, the arts, philosophy, and other areas of knowledge need to step up and do what they’re best at for the glory of the Lord, whether that means making new discoveries in a lab or going and working at a retail job. Do it well! The problem is that Ken Ham is saying we’re falsely accusing Answers in Genesis of being focused on young earth creationism. Sorry, but they are. Suddenly YEC looks like it is the evil “compromiser.” But I’m not going to take that route. Rather, I want to consider arguments, not attacks on character; I want to consider the text, and not bring eisegesis into it by assuming my position is the only possible interpretation. Another classic YEC scare tactics. I pointed it out in my last post responding to Ken Ham. Basically, you take the position you want to refute and then associate it with anything people who already agree with you will think is bad. For example, you could say “Hugh Ross believes in an old earth, just like evolutionists.” Suddenly, the people who read things like AiG’s website know that Hugh Ross is evil. Here’s the problem: Hugh Ross isn’t evil. The statement is no argument. It’s guilt by association. It’s poisoning the well, and it’s unChristian. Scare words abundant throughout. No argument, just assertions. Honestly, this is the best piece of the entire blog post. It sums up Ham’s position well. Basically, he goes in with the assumption that the young earth is the only possible reading of Genesis. Thus, if anyone does not hold to a young earth position, they do not “accept God at His Word.” Now, what he’s saying is that it’s not that the reformation is young earth creationism; rather, the reformation is to re-evangelicalize the church: sola Scriptura! Amen! Here’s the problem: a young earth is not the only possible reading of Genesis, and by putting it forth as such, and explicitly stating that it must be a consequences of “accepting God at His Word,” Ham and others who make similar claims have therefore put their views as God’s views. Their view is, in fact, a consequences of an ultra-literal hermeneutic which they espouse. The text itself does not warrant it. The fact that there is almost limitless reading from authors who argue that the Genesis account is Ancient Cosmology; or that it lines up with one week as part of creation; etc. ; alone speaks to the fact that AiG’s position is not necessarily a consequences of the text, but of their hermeneutic: it’s a consequences of their method, not the source. Bottom Line: Let’s focus on the issues involved in Genesis and the world that God has revealed to us, which is a reliable guide to truth (Psalm 19). The only reason I spend time responding to Ken Ham and others like this is because I do not want such statements to go unchallenged. When a Christian goes around accusing other Christians of being “compromisers” or other scare-words simply because they differ in their interpretation of a passage of Scripture, that Christian needs to carefully rethink the issues and realize “In essentials, unity, in non-essentials, liberty.” Stop throwing out the accusations. Focus on the issues. Frankly, I pray this will happen, but I doubt that it will. As long as one holds one’s own methodology and hermeneutic is the only way to do it, there can’t really be thoughtful dialog. I hope I’m wrong, and I hope that maybe Ken Ham and AiG will be willing to work with others who have different views but still hold to inerrancy of Scripture in order to bring about a whole-church reformation towards inerrancy. But that would require AiG dropping the position that only they are right. Ken Ham on ‘Compromise’ and Stand to Reason– my response to Ham’s initial post. Compromising the Kingdom– Faithful Thinkers offers a really in-depth critique of Ham’s use of emotional and ad hominem attacks. A Brief Word on Ken Ham, Stand to Reason, and the OEC/YEC Debate– two really good points raised in this post. How do our attitudes drive people away? Wow, he didn’t even link to your posts. That shows you how brittle his view is. He won’t dare even point his readers to the specific objections. It strikes me as very insular, sheltered fideistic behavior. If he really is right, then he should be able to come out and debate his opponents. By not citing them, he casts doubts on the objectivity of his views. Well, his view is correct. Period. I wish I could say that nothing surprises me anymore with Ham but he continues to top himself with his own rhetoric lately. He seems to be getting more and more confident in his own anointing as the leader of a new reformation and the more he is resisted the more confident he becomes. If it weren’t for the fact that he has so much influence he would not be worth wasting the time and effort to refute. As you show here and many other have shown over and over again his grasp of logic and biblical hermaneutics is simplistic and flawed. The irony of AIG and Ham is that Ham never had enough training in either science or hermaneutics to be able to assess his own beliefs before he reaches a point where he surrounded himself with people that continue to enable his set of presuppositions to persist. He refers to his hired experts for the answers to all the questions but isn’t able to assess the validity of the arguments of those under his umbrella. This is a pretty incredible exchange. As a YEC myself, I was wondering if the concept “focused on” was ever defined. Was it? Why do you think Richard Dawkins might say that? Is he right? So I was actually saying there has to be more to AiG’s ministry than just YEC. In a sense, I did the opposite of accuse them of being only YEC. Regarding the evolution argument: the point I was making in response to evolution is it is so often used as a scare word, but even YECs tend to believe in “evolution” in some sense, like microoevolution. Or, in reference to Natural Historian’s great post, Baraminology– where all the creatures on the Ark somehow rapidly changed into all the creatures we have today. Not only that, but Ross doesn’t “believe in evolution” in the sense that AiG tries to accuse him of, as I pointed out in the previous post. Thanks for the reply, JW. 1) After all is said and done, how can we determine who is using the Bible correctly, YECs or OECs? Can we? 2) Does the OEC position of an old Earth and old Universe come from the Bible exclusively or is it supplemented with extra-biblical information? 3) Does a word ever receive its symbolic meaning before its literal one? I know you’re very busy, man. So, only respond if you think it’s worthwhile. As always, I look forward to your response, JW. 1) I think we certainly can determine who is using the Bible correctly by seeing how the hermeneutics are applied throughout the Bible. Are they consistent? Do they adhere to Scripture? Do they stretch the meaning beyond plausibility? Do they read teachings into passages where they are not present? Do they ignore teachings that counter their view? You and I would have different opinions on these regarding OEC and YEC, and I’d be happy to have a longer discussion via email if you’d ever like to. 2) I’d answer this with a question, because I think that the question you wrote is clearly leading: “Does any reading of the Bible not rely on extra-biblical information?” I think the answer to this is clearly no. YECs hold that the universe actually does look, observably, young. They try to counter any evidence which would suggest an old earth. If their position is really exclusively based on the Bible, then why bother with the natural world at all? Who cares if it looks old, it just appears that way! (Some YECs do hold this position, which I would argue makes God deceptive.) Not only that, but how does one interpret the Bible? How does one read it? Clearly, one must approach it with the knowledge base they have. If I don’t know the meaning of the word “God,” then I can’t read the Bible coherently. But I would object to the question itself, I think it is definitely a leading question and I would call for a more fair evaluation. 3) I’m not sure I can answer that, because I’d need universal philological knowledge. I did listen to that debate and I do recommend it. Your thread title implies some honesty issues with Ham and AIG but apart from holding a different opinion than yours I fail to see a case for any honesty issues. How about the fact that he says we bloggers are falsely accusing AiG of focusing on young earth creationism and so we are going to be held accountable before God, when his group is a ministry for young earth creationism. Or then there’s the fact that he doesn’t even cite any of those he’s chastising. Why doesn’t he cite the blogs? Is it because he is afraid of people exploring alternative positions? Is it because he didn’t even bother to fully read the articles and so would prefer to keep readers from fact-checking him for accuracy? Is it for some other reason? Who knows? What about the constant use of scare tactics by lumping positions with which he doesn’t agree with the standard YEC lines of “compromisers” or “man’s fallible _____” and the like? Hi Michael, I can agree with that assessment. It can be tempting to say someone is being dishonest when they are just plain reporting information incorrectly or don’t understand what they are saying. I have been known to think that Ham and other area at time willfully ignoring or bending data to suit their needs but that is difficult to prove since I can’t read their minds I just know it looks that way. However, I’m come to believe that Ham really does believe himself to be honest and believes he is right in everything he says. He many deep down know that some data he just can’t explain but he believes that no data can actually contradict his position since he believes it to be correct so he can honestly say that he doesn’t believe anything other than data that supports his views. But just because he may be completely honest doesn’t mean he is right. I am sure that most Mormons believe they are right, I am sure that Camping really believed the world was going to come to an end and was not at all dishonest in his predictions. I am sure that Jack van Impe believes all his predictions of the Apocalypse based on political and natural events around the world because he believes the Bible backs up his positions. None of this honesty makes any of these positions true through. Plenty of well meaning people are honestly wrong even when they believe the Bible is on their side. I think I am as fair as I can be with the arguments and data I present but I certainly could also be wrong but I think I can defend myself both with general and special revelation but I don’t ever want to reach a point where I can’t be shown any errors in my thinking. Overall, A persons honesty doesn’t put them beyond criticism but it does change the form and mode of criticism. Thanks for the comment, Natural. The main reason I put honesty in the title anyway is because of the conclusion: I’d like to see we Christians honestly working together to defend the Bible as the word of God, as opposed to defending our own narrow positions as the only possible view. That was the main impetus for the title, and while I do think that while Ham is probably acting honestly in his intentions, the tactics he uses are not conducive to honestly viewing the oppositions best arguments. Rather, by simply associating anyone with whom he disagrees with words like “compromiser” or sayings like “so and so is using man’s fallible ______”, he effectively cuts off the debate. If I had to believe in Mr. Ken Ham’s theology, I would have to be an atheist. Fortunately, for me, I have come to an understanding that is in tune with the universe that I live in. Why do YEC people think that GOD talked in parables when he walked the earth, but when trying to reach the minds of a primitive society, was incapable of that means of communication? When you tell a young college student that I am going to give you the truth and then present them with something that they have scientific evidence is wrong, you devalue your testimony to your religion. I urge everyone going through this dilemma to take a look at the theology of the Catholic Church. Having learned from being on the wrong side of the geo-centric issue against Galileo, the Church has been remarkable in seeking a scientific understanding at the highest levels. This is one of the major reasons that I am a member of the Catholic Church today.